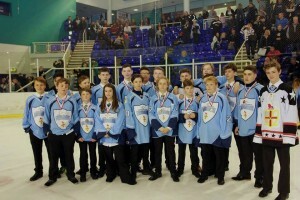 Bradford Bulldogs Ice Hockey Club has played a major part in the North’s success. 20 players from Bradford Bulldogs Ice Hockey Club represented the North of England in the 2016 EIHA inter conference tournament, which took place recently. The tournament, which took place in Sheffield, saw the best players in the country from the North, South East, South West, Midlands and Scotland compete against each other to become EIHA Conference Champions, in this showcase event. The North U11s beat Scotland and the U15s beat the Midlands to be crowned champions. The Under 13s reached the final. As well as the Bradford players helping their teams achieve the North’s most successful year for some time, two players were selected for the All Star Team in the closing ceremony presentations. Jacob Lutwyche (U15s) was named as an All Star Forward while Lewis Baldwin (U17s) picked up the award as a defenceman. In addition to these, twelve Bradford players were successful in being selected to their national team squads for the 2016/17 season, as well as two former Bradford players who were not playing in the tournament due to currently playing in North America. The Under 13 s team also won the Northern League for the second year running.